I found this recipe in January's Bon Apetit. It sounded like the perfect sweet and salty treat for a rainy afternoon like we had today. Since the issue is entitled "The Cooking School Issue," I suppose that accounts for the THREE different types of sugar required. I fortunately had them all on hand, however, I still have no idea why powdered sugar is necessary. Probably, if you didn't have any one hand, you might experiment with just a bit more granulated (~ 1/8 c) to achieve the same texture and taste. As has become my habit with cookies, I made a batch and froze the rest of the dough in little balls so whenever we next want cookies, I can pop them straight into the oven for a quick treat. This recipe makes large (3") relatively flat cookies with a nice crunch but also a little bit of chewiness. It's possible that the texture will be different when I bake the dough in the freezer, so I'll try to update this if that occurs. 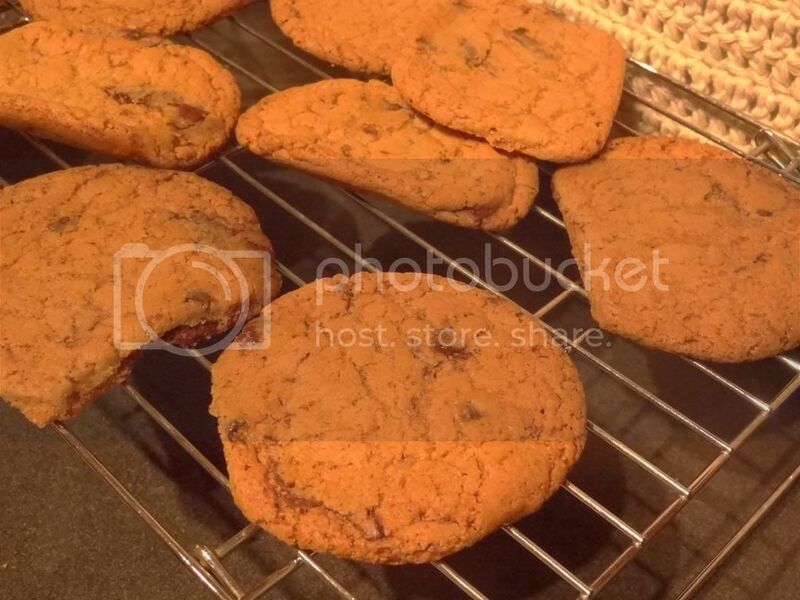 I halved the chocolate suggested by the recipe and thought the cookies plenty chocolatey. Very tasty cookie. Next time I might add some chopped walnuts, but these were great as is. In a medium bowl, whisk together dry ingredients, except sea salt and chocolate. In a separate medium bowl, beat butter and sugars until light and fluffy. Beat in egg yolks, egg, and vanilla until mixture is pale and fluffy. Reduce heat to low, slowly add dry ingredients. Mix until blended--do not over mix. Fold in chocolate. Using a 1 TBS cookie scoop, place on parchment paper-lined cookie sheet at least 2" apart. Sprinkle with sea salt. Bake 10-12 minutes until golden brown. Cookies will still be very soft and will firm up during cooling. Let cool for a few minutes on cookie sheet, then move to wire rack and cool completely.